Unimog (pronounced /ˈjuːnɨmɒɡ/) designates a range of multi purpose four wheel drive medium trucks produced by Mercedes-Benz, a division of Daimler AG. The name Unimog is pronounced [ˈuːnɪmɔk] in German and is an acronym for the German "UNIversal-MOtor-Gerät", Gerät being the German word for machine or device. They are built in the Mercedes truck plant in Wörth am Rhein in Germany. New Unimogs can be purchased in either of three series. Medium series 405, also known as the UGN ("Geräteträger" or equipment carrier), is available in the U300-U500 model. heavy series 437, also known as the UHN ("Hochgeländegängig" or highly mobile cross country), is available as the U3000-U5000 model. U20 is the smallest Unimog. It is based on a shortened U300 frame and has a cab over engine compartment from the Brazilian Accelo light truck (Caminhões Leves) series. The first model was designed shortly after World War II to be used in agriculture as a self-propelled machine providing a power take-off to operate saws in forests or harvesting machines on fields. It was designed with permanent 4WD with equal size wheels in order to be driven on roads at higher speeds than standard farm tractors. With their very high ground clearance and a flexible frame that is essentially a part of the suspension, Unimogs are not designed to carry as much load as regular trucks. Due to their off-road capabilities, Unimogs can be found in jungles, mountains and deserts as military vehicles, fire fighters, expedition campers, and even in competitions like truck trials and Dakar Rallye rally raids. In Western Europe, they are commonly used as snowplows, municipal equipment carriers, agricultural implements, construction equipment and road-rail vehicles. 4.6.3 1994 – The "Funmog"
Unimogs have very high ground clearance — greater than the Humvee — made possible by portal gears that allow the axles and transmission to be higher than the tires' centers. Unimogs also feature a flexible frame that allows the tires a wide range of vertical movement to allow the truck to comfortably drive over extremely uneven terrain, even boulders of 1 metre in height. They are equipped with high visibility driving cabs to enable the operator to see the terrain and more easily manipulate mounted tools. The newest Unimog models can be changed from left-hand drive to right-hand drive in the field to permit operators to work on the more convenient side of the truck. 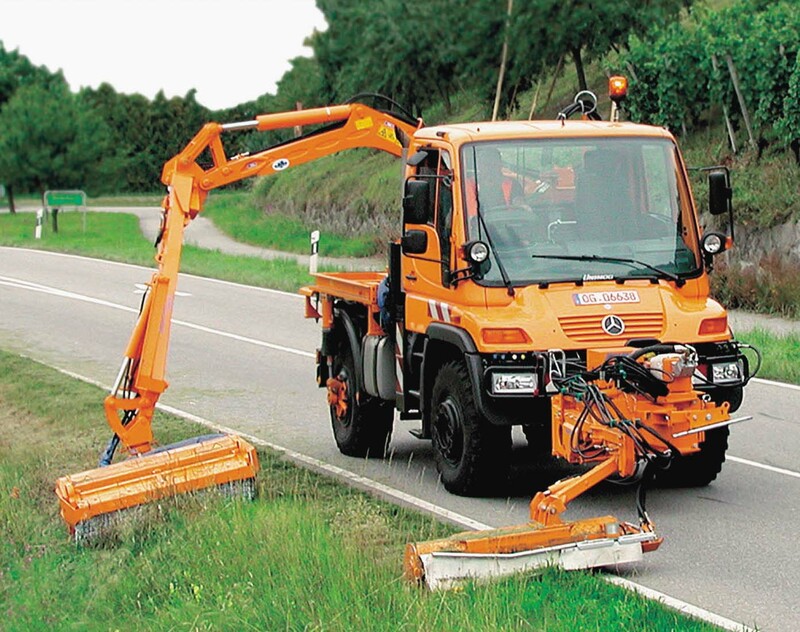 The ability to operate on highways enables the Unimog to be returned to a home garage or yard to thwart vandalism. Unimogs can be equipped with front and rear tool mounting brackets and hydraulic connections to allow bucket loaders and hydraulic arms to be used. Most units have a power takeoff (PTO) connection to operate rotary equipment such as snow brooms, snow blowers, brush mowers, or stationary conveyor belts. All Unimog models except for the 404S have a diesel power plant varying from 25 horsepower (19 kW) to upwards of 280 horsepower (205 kW). Unimogs are available with short wheelbases for tool carrier operations or long wheelbases for all-terrain cargo carrying operations. The Unimog model with the largest single-design production run is the Unimog 404.1. The most common versions of this model were produced in troop carrier and radio box/signal truck variants for the German Army and other Western European armies. It was powered by a 2.2-litre M180 waterproofed Mercedes-Benz petrol engine that produced 80 horsepower (60 kW) as standard. As this engine was based on the one in Mercedes-Benz 220 cars, more power was available, up to 145 horsepower (108 kW), with high compression heads. The 404.0 was available with the 2.8-litre M130 petrol engine that produced 110 horsepower (82 kW) as standard with up to 185 horsepower (138 kW) available with high compression heads and fuel injection. Apart from the German Bundeswehr, Unimogs have been used by many different militaries, including the Argentinian, British, Belgian, Danish, Dutch, French, Portuguese, Finnish, Estonian, Greek, Swiss, Chilean, Bolivian Naval Force,  Mexican, Pakistani and Singaporean armed forces. They are also used extensively by the Brazilian Marine Corps, South African National Defence Force, the New Zealand Army, the Turkish Army and the Australian Army. The Unimogs are used as troop carriers, ambulances, and mobile command centers equipped with radios (radio boxes). The United States Marine Corps use an engineer version, while the United States Army uses Unimog vehicles to access remote installations. Unimogs are used by German disaster relief organisation Technisches Hilfswerk (THW), by Fire Departments and municipalities as utility vehicles. They can be used as material handlers, auxiliary power providers (generators), and equipment carriers. Their ability to operate off-road, in deep water and mud makes it easier to access remote areas in emergency situations. They are commonly used in snow removal where other vehicles might not be able to operate. Most European Alpine towns and districts are equipped with one or more Unimog snow blowers to clear narrow mountain roads that have drifted closed. In construction, Unimogs are used as carriers of equipment and, with the optional extended cabin, also of workers. They can be equipped with a backhoe, front loader, or other contracting equipment. On railroads, Unimogs are used as rail car movers and road-rail vehicles. In agriculture, Unimogs are used to operate farm equipment. While most farm field implement operations are now performed by a tractor, Unimogs are used to haul produce, machinery and animals. They are also used around the farmyard to run chippers, grain augers, and conveyors. Unimogs are also used as a prime mover, to pull heavy trailers, large wheeled conveyances or even Jumbo Jets. Often, only the "Triebkopf" front half is combined with a tailor-made rear. Unimogs are used as tourist transport for jungle ecotourism or safaris. Unimogs have been uncommon in North America because of differing vehicle regulations and requirements from those in Germany, and due to the lack of a North American sales and support network. Most Unimog models found in North America have been imported by individual dealers or independent enthusiasts. Between 1975 and 1980 the Case Corporation (now merged into CNH Global) imported the U-900 model into the United States and sold it through Case tractor dealerships as the MB4/94. In 2002 DaimlerChrysler tried to re-enter the North American market and engaged in 4 years of aggressive marketing, such as truck and trade shows, Modern Marvels, numerous magazine articles, extensive demo tours, and individual demos. North American retail models were officially limited to the U500 series (the North-America-specific member of the UGN series) sold through heavy-truck dealerships, generally Freightliner dealerships. Freightliner is a Daimler AG subsidiary. The UGN series was specifically manufactured for the North American market and was significantly different mechanically from its European counterpart. The UGN faced stiff competition in North America by manufacturers whose truck or equipment lines performed some of the same duties as the Unimog. Some of them are Caterpillar, John Deere, AM General, Sterling Trucks (also a Daimler AG subsidiary), and General Motors. After 5 years and selling only 184 Unimogs, Freightliner LLC has exited the market. Parts and service support remain for 20 years. Unimogs are used in two kinds of competition: Dakar Rally and other desert Rally competitions, and slow-moving Truck Trials over obstacles. Unimogs have won the truck class of the Dakar several times in the 1980s, often by accident as their main purpose is usually to provide support for cars and motorbikes. High-powered factory-sponsored entries of truck companies aiming for the overall win have since taken the laurels, with Unimogs mainly used for service purposes. Occasionally they can be seen pulling much larger trucks out of quick sand. In 1973 the Unimog department in Gaggenau also designed the MB Trac, a more tractor-like version. It was produced by Daimler-Benz until 1991, when the product line was sold to Werner Forst- und Industrietechnik, which continues to produce it as the WF-Trac. It is sold and maintained by the Mercedes Unimog dealers. The Mercedes G shares some features of the Unimog, which eases maintenance for military and industry users who also use the Unimog. The Unimog also serves as a technical platform for armored vehicles like the ATF Dingo, a mine-protected utility and reconnaissance vehicle used by the German Forces in international missions. Armoured vehicles developed in Germany using Unimog chassis are the UR-416, the Sonderwagen 4 and Condor 1 in Police service, and the ATF Dingo used by the Bundeswehr in Afghanistan. The Buffel, RG-19 and Mamba APC Armoured Personnel Carriers from South Africa are based upon the Unimog driveline. The AV-VBL developed by Brazil's Tectran is also an AFV family based on the Unimog. The Swedish Landsverk Company produced an armoured scout car based on the Unimog S404 in the late 1950s. The Irish Army purchased 15 of the vehicles (originally intended for the police force in the Belgian Congo) in 1971 at a bargain price. They were intended as a stop-gap vehicle for use until the first Panhard M3 VTT APCs entered service in 1972. The type had excellent off-road capability but poor on-road handling due to a high centre of gravity and several accidents occurred as a result. A four-man dismountable squad was carried, but space was cramped, and in any case a four-man detachment was far too small for any sort of realistic military purpose. Other considerations were that the FN MAG gunner's position was too exposed. Eventually the Unimog Scout Cars arrived in Ireland in February 1972, their departure having been delayed by a local peace group who thought they were destined for the Provisional Irish Republican Army (PIRA). By mid 1978 all had been transferred to the Irish Army Reserve, the FCA. All were withdrawn by 1984, and two are preserved; one in the transport museum in Howth Co Dublin and one in England. This section contains information translated from the German language Wikipedia page for Unimog. Germany was to become an agrarian state following World War II according to the Morgenthau Plan. Unimogs were developed in post-war Germany to be used as agricultural equipment. The Unimog was designed with equal-sized wheels, a mounting bracket in front, a hitch in the rear, and loading space in the center. This was to make it a multi-purpose vehicle that farmers could use in the field and on the highway. Minneapolis-Moline had developed the UDLX Comfortractor for North America in 1938 with a similar concept in mind. Albert Friedrich designed the first model and entered a production agreement with Erhard und Soehne (Erhard and Sons) in Swabian Gmuend (Schwäbisch Gmünd). Development began on January 1, 1946. The first prototype was ready in the end of 1946. The prototype was equipped with a gasoline engine because the development of the OM636 diesel engine had not been finished. The prototype looked almost like the Unimogs that were built later. The original track width of 1,270 millimeters was equivalent to two potato rows. The 25-hp (19 kW) OM636 Daimler Benz diesel engine became standard equipment in the first production Unimogs at the end of 1947. The original symbol for the Unimog was a pair of ox's horns in the shape of a letter U. The first 600 "70200" series Unimogs were built by Boehringer. This was mainly for two reasons: Erhard und Soehne did not have the capacity to build the Unimogs and Mercedes Benz was not permitted to build all-wheel drive vehicles at that time. After Daimler Benz took over manufacture of the Unimog in 1951,(Unimog 2010)the three pointed Mercedes star began to appear on the front of the vehicle and replaced the Unimog ox horn symbol. The new model became known as the series 401. A new series 402 with a long wheelbase chassis (2,120 mm (83 in) instead of 1,720 mm (68 in)) also became available. The vehicles began to be manufactured in Gaggenau, in Baden-Württemberg. Production continues there as of 2006. An enclosed driver's cab was available as option starting in 1953, making the Unimog a true all-weather vehicle. In 1955, the first Unimog 404 S series were produced. The primary customer of the 404 S was the Federal West German army, which was re-arming in the face of the Cold War. The 404 was intended to be a mobile cross-country truck, instead of an agricultural implement. The 404 S is the most popularly produced variant. 64,242 were produced between 1955 and 1980. The Unimog is equipped with a fully synchronized transmission allowing easy shifting while at speed. It is one of the first agricultural tractors to be so equipped. The 406/416 middle series were produced beginning in 1963. They were equipped with a six cylinder diesel (OM312) producing 65 hp (48 kW). The 406 and 416 are similar, The 416 having a longer 2,900 mm (110 in) wheelbase compared to 2,380 mm (94 in) for the 406. Later models were equipped with the direct injection OM352 diesel engines starting with 80 hp (59 kW) and going up to 110 hp (80 kW). Between the original Unimog and the middle series, Daimler Benz developed a light series 421/403. This was later supplemented by the 413 line. They differ by the wheelbase and the engine power. The 421 has a 2,380 mm (94 in) wheelbase and the 403 has a 2,250 mm (89 in) wheelbase. The new engines come from the passenger car line (421/U of 40 hp (30 kW) with 2.2-litre capacity), and from the Benz truck line (403/U of 54 hp (40 kW) with 3.8-litre capacity). 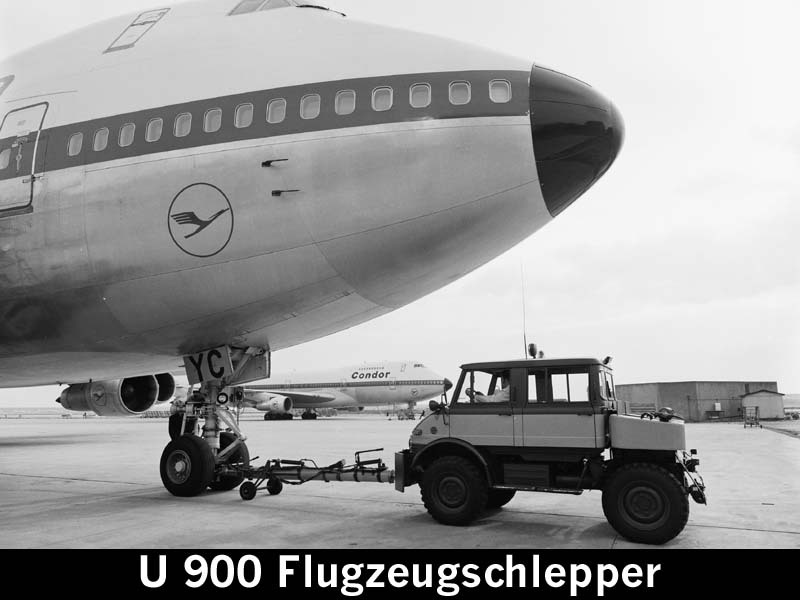 The 100,000th Unimog was built in 1966 in Gaggenau. The Unimog was quite successful, except as originally intended as an agricultural platform. Daimler Benz produced a new vehicle in 1972, the MB Trac to be more oriented to larger scale mechanical farming. The new tractor crossed the Unimog technology of all-wheel drive and a power transmission to four large equal-sized wheels, with the appearance of a tractor: slim hood, behind it an angular, highly rising driver cab. In contrast to conventional tractors the cab is situated between the axles, similar to large North American four wheel drive tractors. There is no articulation between the front and rear sections as with the American tractors. From the initial MB-trac 65 and MB-trac 70 (later 700) a broad platform developed to the heavy duty MT-trac 1800 within a few years, though the MB-trac was not a huge success. Daimler Benz later merged the MB-trac with the agricultural machinery activities of Deutz AG. The manufacturing of the MB-trac series ended in 1991. In 1974, The new U 120 of the "heavy" series 425 Daimler Benz, extended the Unimog available models with an additional heavy line. The new, angular cab is remarkable with a large, forward hood sloping to the nose. The hood flows down in a wide, black grille. The appearance of this driving cab remains unchanged in principle in 2006, more than one quarter century later. The series 425 have a 2,810 millimetres (111 in) wheelbase and nine tons permissible total weight with 120 hp (89 kW) (shortly thereafter 125 hp (93 kW) as U 125). 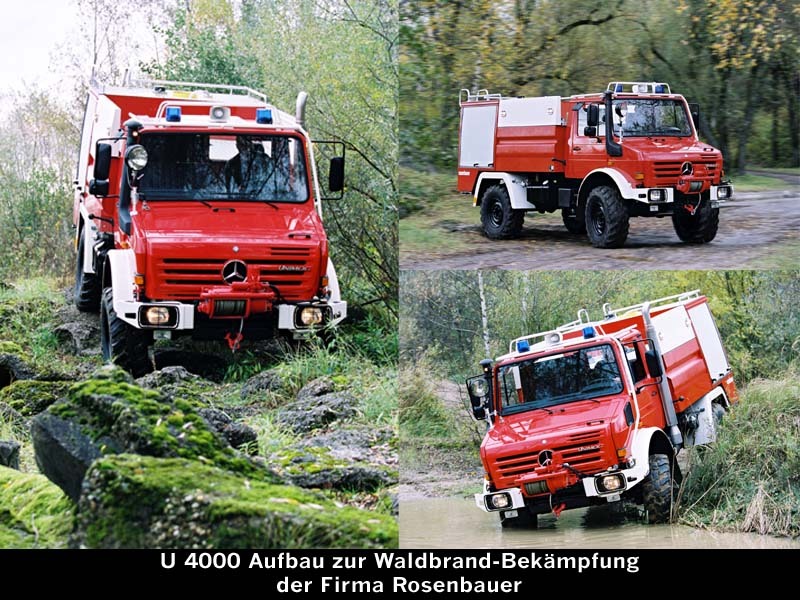 For the German Federal Armed Forces likewise, the manufacturing of the series 435 began in 1975 as a successor of the Mercedes Benz Unimog S 404. The 435 was characterized by a long wheelbase of 3,250 mm (128 in), 3,700 mm (150 in) or 3,850 mm (152 in). The new angular 424 "middle" series of Unimogs were produced starting from 1976. They are designated U 1000, U 1300/L, U 1500, and the flagship U 1700/L with 124 kW (168 hp) engine performance. The Unimog with the rounded driving cab became known as the light series. The new series with angular cab were divided by payload into a middle and heavy series. Some engines overlap – the Unimog nomenclature is not simple to understand (see below for notes on series names). The long-proven Unimog-S (404), although with clearly decreasing number of items, is the single remaining "Benziner" in the lineup. With the exception of the entry-level model, all Mercedes Benz Unimogs for 1976 were equipped with four wheel disc brakes – many years before this safety equipment was mandated for trucks. Unimog number 200,000 is produced. Introduction of the light and medium range: 407 and 427. Introduction of the new light models 408 (U90) and 418 (U110-U140) with newly designed cabins replace the predecessor models. The new very diagonal front portion gives the operator a good overview forward. The asymmetric front hood, which is lower on the driver's side, permits the best overview of connections and attachments. A new framework and progressively working coil springs improve the handling for the Unimog. The completely re-arranged cab with a high roof offers more space than previously, distinct controls, and not least, a friendly workplace. Among the technical characteristics for the new Unimog are: the tire pressure adjustment system that can be operated while driving, anti-skid system, new engines from the passenger car range for the U 90 of the easy series rank as well as "Servolock", a mechanism for the hydraulic connection of implements. The culmination of the 1993 program is the Unimog U 2450 L 6×6, an all-wheel-driven 3 axle truck. Engine performance increased tenfold with this new top model compared to the original Unimog. The Unimog club in Gaggenau is brought into being. Mercedes Benz brings out the "Funmog", which is limited to twelve copies. With luxury extras such as leather seats, carpets, and the like available, the Funmog is the most expensive Unimog. Selling price for the Funmog starts from DM140,000. Introduction of the very small model UX100. It is designed to slip speedily over sidewalks and by park plants. It is sold off after a few years of production to Hako, which are specialized in vehicles of this kind and size. Production is transferred from Gaggenau to the Wörth am Rhein Mercedes-Benz-LKW-Montagewerks, the largest truck manufacturing plant in Europe. At the Dubai Motor Show in December, the "Unimog U 500 Black Edition" premiered as an offering to wealthy desert-dwellers. It is a similar luxury offering comparable to the Funmog. At the IAA 2006 commercial vehicle show in Hanover a new Unimog U 20 was presented, which will be available at the end of 2007. The most striking feature is the cabover design with no vestigial front hood characteristic of the traditional Unimog. It has a total weight from 7.5 to 8.5 tons. The underlying technology comes from the U 300. The driving cab is from the new Brazilian Accelo light truck (Caminhões Leves) series. The wheelbase is shortened to 2,700 mm (110 in). UR-416 armored car based on Unimog truck, in Batey ha-Osef museum, Tel Aviv, Israel. 2005. The car was used by Arab militants. NZ Army U1550L Unimogs undertaking driver training on the weapons range in the Kaipara District. NZ Army driver trainees strip down a U1550L Unimog. Unimog series numbers like 401, 406, or 425 in this article are the factory numerical designation ("Baumuster" in German). Unimogs also have a sales model number like U80, U120, or U1350. Each series can have several model numbers, as they are equipped with different engines. The "U" model numbers were roughly equivalent to the horsepower of the engine. A 424.121 with a 2,630 mm (104 in) wheelbase equipped with the 100 hp (75 kW) OM 352 engine is a U1000. A 427.100 with a 2,650 mm (104 in) wheelbase and the 100-hp 366 engines is also a U1000. Starting in 1976, model numbers have an extra 0 at the end. However, more recent models like the U5000 are really only rated at 218 hp (163 kW). ^ Bill Cawthon - Freightliner and the Unimog. February 22, 2001. Quote: Freightliner LLC expects to sell about 300 Unimogs in the U.S. in 2002. This page was last modified on 9 March 2009, at 22:26.